March | 2013 | Every good thing…. Well, it sounds reasonable enough, sure we can do it. Life can be hectic. We have not been to the boat in a few weeks so I am getting a bit stir crazy. I have spent a few days on ActiveCaptain looking into taking a vacation. After consulting with Lori we now have a plan. Travel 300+ nm and enjoy doing it, some outside, some in the ditch. Amelia Island, Fernandina Beach, St. Mary’s, Cumberland Sound -Via- NSB, St.Augustine and Jacksonville . There are a number of parks, plantations and small towns we can stop at and check out up in that area. We hope to spend half the time out on the hook and avoid dock fees. The town marina at St.Mary’s is only $1 a foot with shower,power and water, so it is high on our list even if there is not much to see there besides a submarine museum. Yikes, a bunch to do. With Easter, Church, work, trips to the doctor and dentist and a birthday party our next week will be very busy. Here is a short list of things I want to get done on the boat, possibly with a few trips crammed in after work to get it prepped. Thankfully days are getting longer, but then again so is my work list. The good part is only the Ding, battery, anchor and food are the big things to do. Pull out the ground tackle again and measure and mark length, were we are going it is much more tidal than anyplace we have stayed before and I do not want to be guessing at measurements when putting out the anchor. Finish the vinyl flooring, I never did lay it into the head and it would be nice to have it done. The fake wood grain feels good an bare feet. Get some lock nuts to put on the tiller, the nuts holding the tiller on tend to back themselves off and need to be tightened daily. Not a the end of the world but annoying. Replace the metal pipe on the cooler drain with a plastic one. Why the used a 3″ length of galvanized pipe on that drain to couple 2 hoses together alludes me. A pvc fitting will work just fine and not corrode like the metal has, hampering draining of the icebox. Best laid plans and all that jazz… Coffee break. What a couple of days it has been. Not bad days, just days that you have to roll with things and do your best. Thursday morning the F-150’s battery finally called it quits after 6+ years of service. 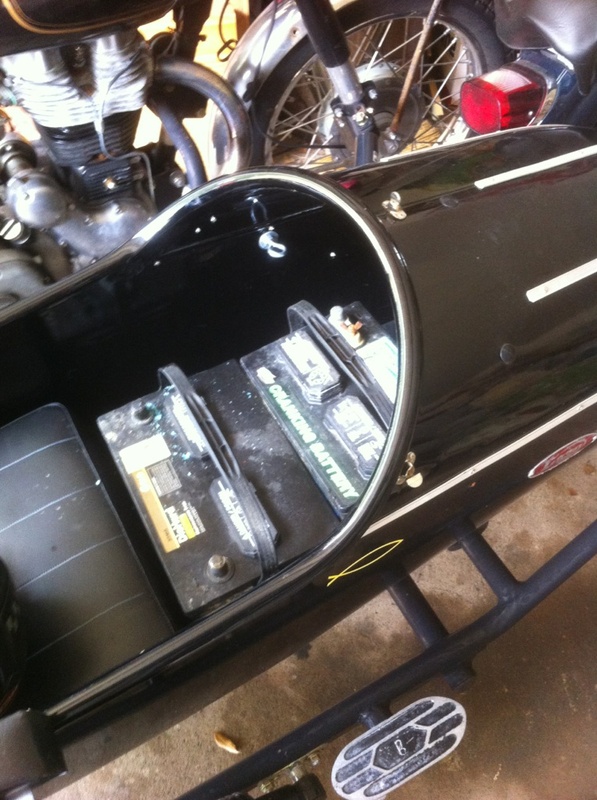 I pulled it out that night and loaded into the sidecar along with the Clews 2nd battery that I need to replace. I planned to run by Sams club after work, get the batteries, run by CVS and pick up a perscription and still be home in time to make it to a church dinner. Well, as it turns out I got hung up on a job at work and did not get back to town until 6:30pm and as luck would have it had just started to rain. I bee lined it home in a light drizzle and as I pulled up the drive was rewarded with a clang as my kickstarter fell off. I count myself as lucky since as it could have fallen off on the road never to be seen again. Had I made my planned stops I may have been stranded. 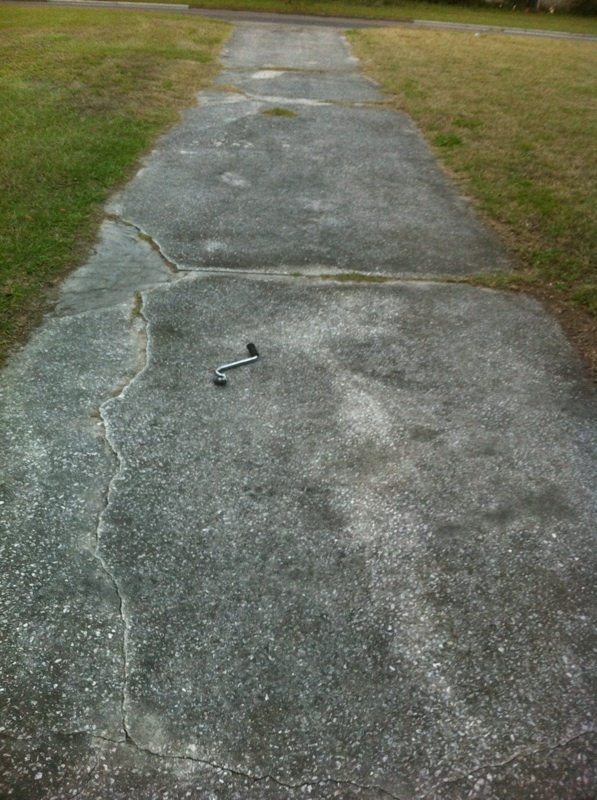 This reminds me, I need to check the trunk of the sidecar and make sure the tool kit is still there. Off I went to the pharmacy in the car, no church dinner for us. I picked up pizza and was rewarded for the effort by loosing a crown. Crunch crunch… Nice..
Our quest for a workable dinghy is at an end. 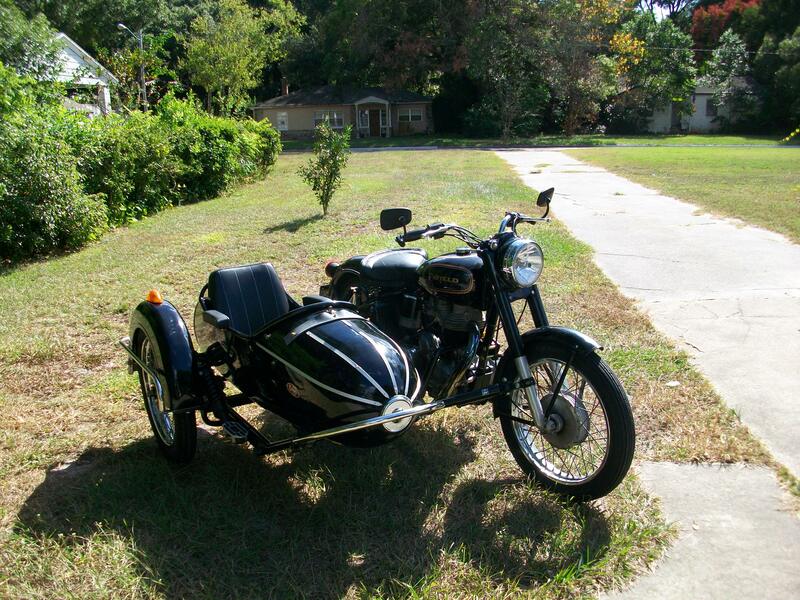 I have been scouring the local Craigslist for a ding and found an Achilles 8ft Hypalon dinghy nearby. We went and took a peak at it today and were thrilled with it, bought it on the spot. It is obviously superior to the PVC ding we currently have. Can’t wait until we get to try it out with our outboard. 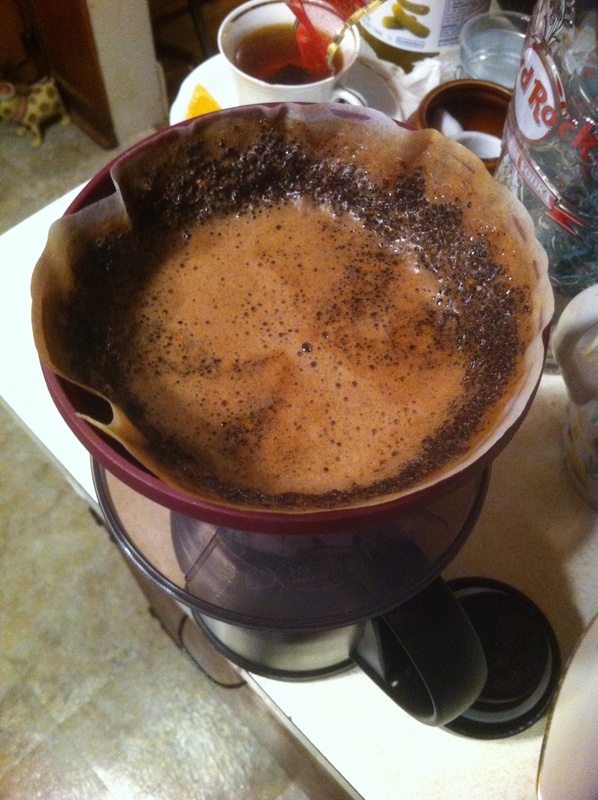 I have been using the trusty old french press for my coffee as it makes a pretty good cup of joe. However after a few weekends cleaning the rig get tiresome as it is pretty messy and requires a bit too much water to rinse out well. Here is the filter. It works well with a #4 cone. 2 cones of water will fill my new mug. I think this is one of the best travel mugs ever. It is Vacuum insulated (floats), spill resistant, has a wide sticky rubber base, perfect for the boat. 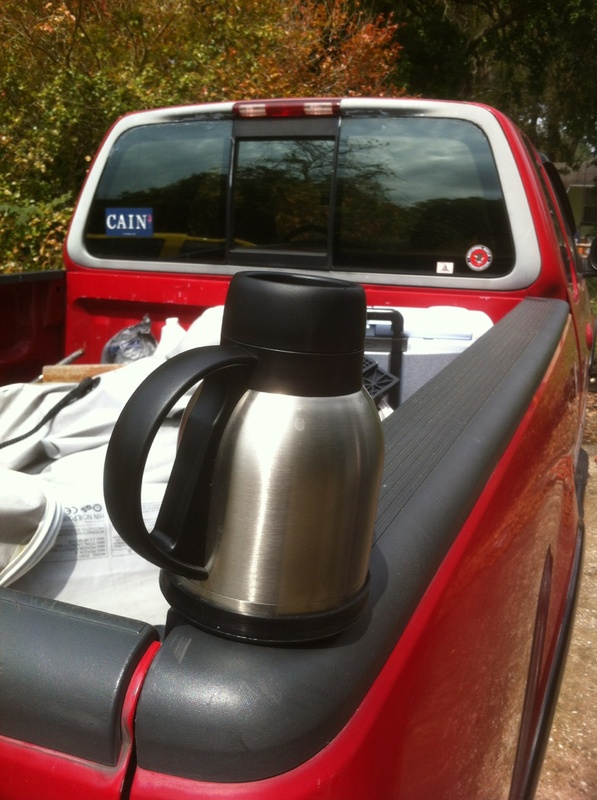 I have used it the last 2 weekend and it will keep 20oz of coffee warm all day. I love this mug. Life is full of curves. It looks that our 3 week trip to the Keys and Dry Tortugas are out this year. We will most likely be taking a week or so sailing to St. Augustine instead. The plan being 3 days up and 3 days back with a few days on the hook near the fort. Looking at the calender we have zero full days off without any commitments before we depart in early April. It looks like we will be taking some trips out to the coast during the week to prep the Clew. Life is busy. This post goes under provisioning and long term planning. We do not plan on getting a watermaker for this boat as the cost of a good one would be over 100% of what we paid for the boat itself. For the next few years we plan to just use a bunch of gallon jugs and the on board tank. Annoying at times, but since we are not intending to take the Clew out for more than a few days at a time we can make the arrangement work. 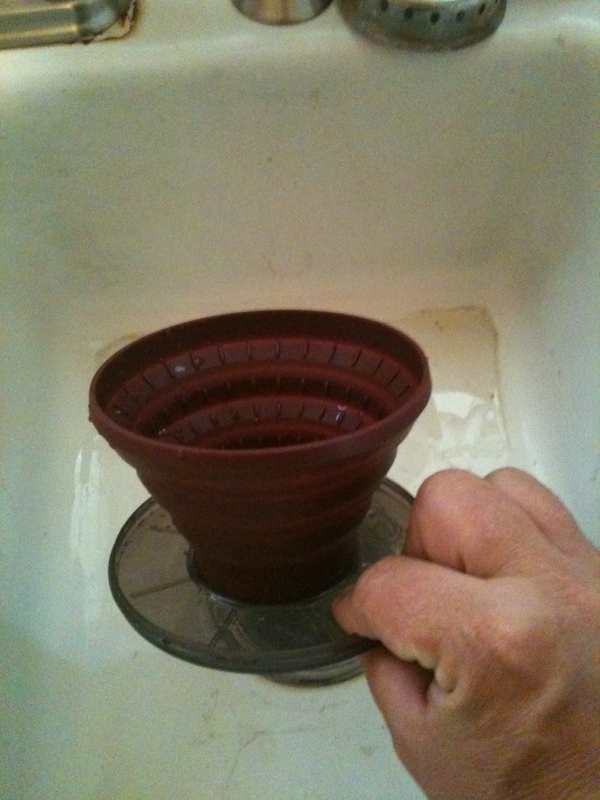 Here is a LINK for a watermaker. Our next boat will be a 32 to 38 (who knows, we may want a 42 when the time comes). We intend to do longer passages and travel to Europe and the South Pacific so a watermaker is on the radar in about 8 or 9 years. Here is an interesting article on a new breakthrough in watermaker tech. Invest in Lockhead if this works out. It has applications in more fields than boat alone. It is good news all around. A tale of Medium Wind, Big Wind, leaking dinghies, batteries, bacon and eggs. Where to start on this weekends activities. We started off slowly after getting out to the boat late Friday night. First task, inflating the dinghy with our new Max Burton 12v vacuum cleaner. The vacuum worked like a charm, the ding, not so much. To date I have found 3 major holes in the forward section and am trying to locate a small leak in the rear chamber. 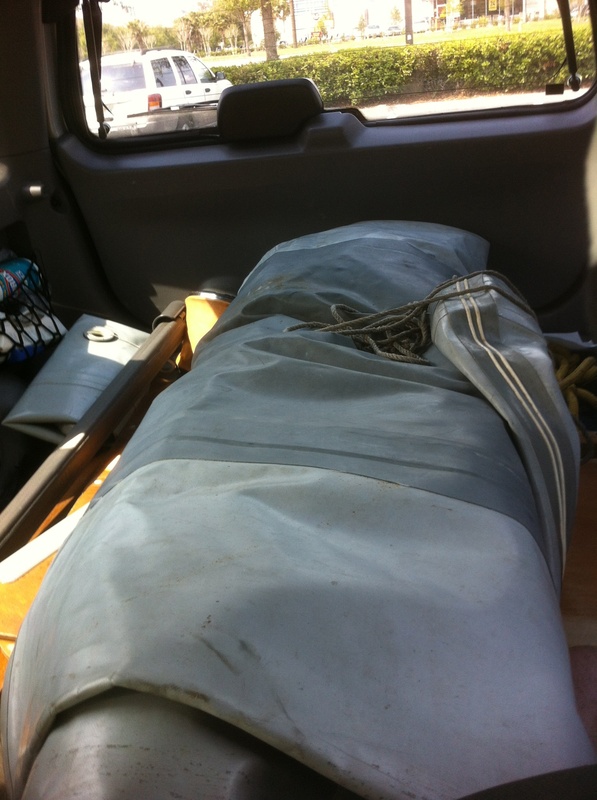 We just loaded into the back of the truck and I will give the thing a few days work, patches etc. Hopefully I can salvage it for a few years use. If not I will probably get a slat floor roll-up zodiac style dink from Defender. The time it took for inflation and shear size of the beast is troubling. Possibly too large to keep on deck, I have concerns about taking it to the Keys and moving location every few days. After burning the morning fiddling with the dink and filling water tanks we cast off our lines and motored over to the fuel pier. We filled up with enough fuel for 4 days of continuous motoring. We hold 24 gallons, 12 on deck and 12 in the saddles. I purchased a nice siphon hose so pouring is not required to refill the saddles. We have an addition 6 gallon we will bust out when we go to the Keys. Pulling away from the marina just after noon we raised sail as soon as we were in the main channel of the ICW (intracoastal waterway). The wind was 8 to 10 knots out of the east so we had a nice beam reach as we headed south on a Port tack. The first 4 hours of the trip were uneventful. 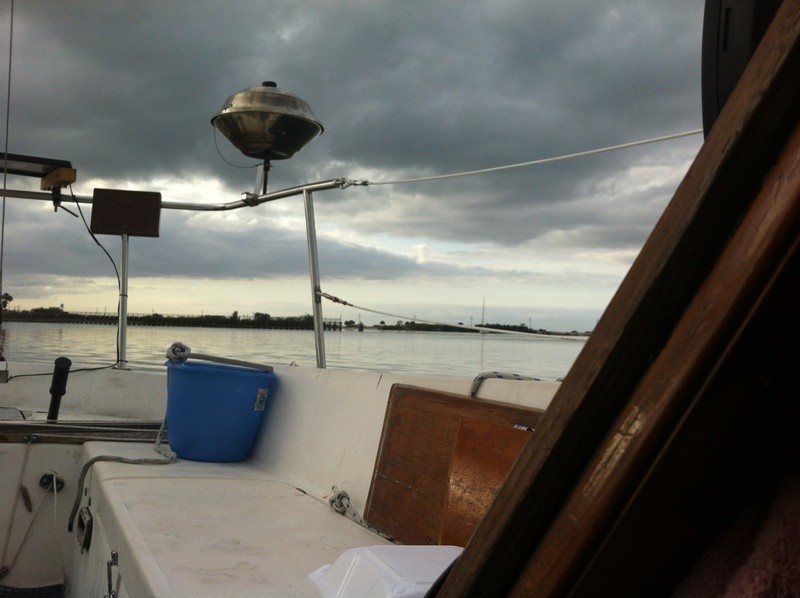 Under full main and jib we averaged 5 knots all the way down to Merritt island, very pleasant sailing. Skies were partly cloudy and it seemed to be getting darker. Just as we were about 30 minutes from making our turn Lori took over the tiller so I could go below and tend to business. No sooner than had gone below than we were hit by an unexpected gust of wind. Probably 20 knots, it pitch the boat over to about 25 degrees of heel. 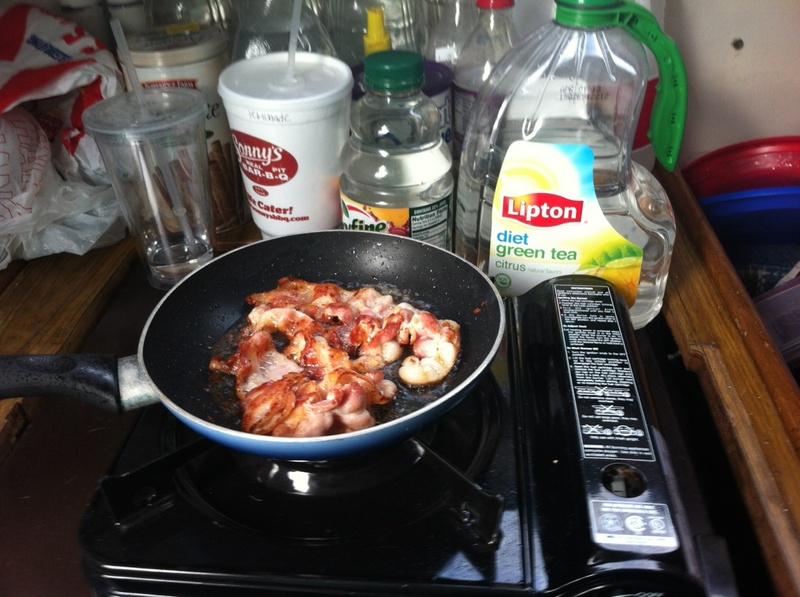 Everything came crashing down in the galley as it is on the port side. Coffee grounds and peanuts everywhere, startling. Lori turned up into the wind a bit jarred and I took back over on the tiller and adjusted out the main to keep the heeling in check. The wind had picked up to over 15knots and we did the rest of the southern leg of the trip hull speed. Fairly exciting. 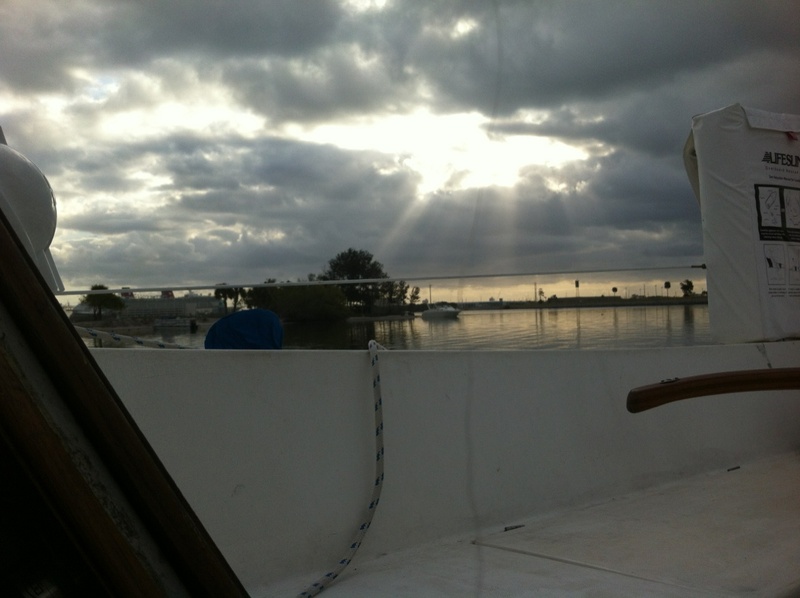 When we got to Merritt Island turned down the canal and motored past the marina were the Clew previously lived. After stopping at HarborTown Marina for dinner and to walk the dogs we threw out the hook at a spoils island near the Port Canaveral locks near the cruise ships just as the sun had set. 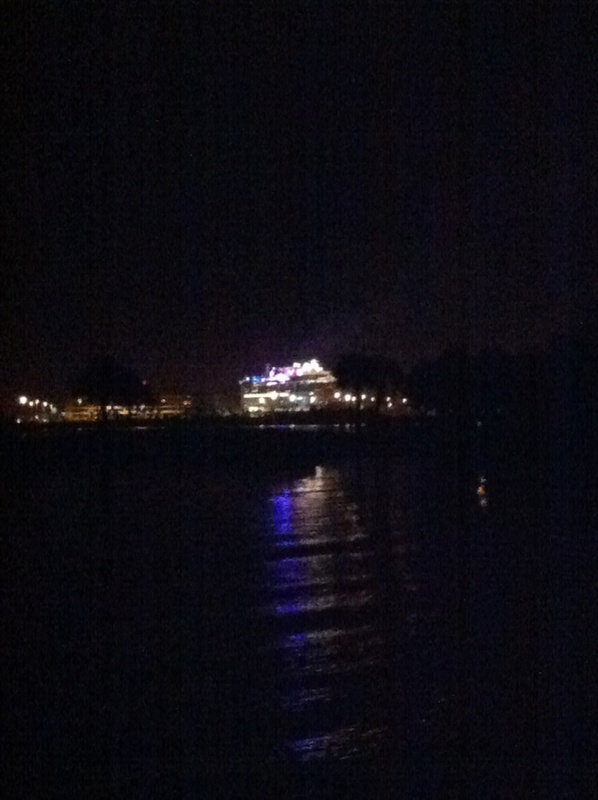 The Disney cruise ship was in port. There were small 3 boats at the island with a campfire and music to go with. Not that bad but it was very strange to wake up for a moment at 3:30am to the sound of Twisted Sisters “We ain’t gonna take it” floating across the water. Sunday morning started pretty slow. With us waking at around 9am. Looking out across the water as we cooked out bacon and eggs the wind was calm. The folks on the island were just stirring and it appeared they had not prepared for 50 degree weather as they were still wrapped in their sleeping bags as the stoked back up their fire. Sorry, I did not realize the winch was blocking the view of the fire as I snapped the picture. As Lori and I sat in the cockpit eating our breakfast we watched as the wind went from 0 to 5 then to 10 knots. It built fairly fast. We pulled anchor after breakfast and headed back down the canal for the ICW, the sun was breaking through the clouds, and a strong wind was building from the east. It was time to head back to Titusville. As we waited for the draw bridge to open we had to use about 20% reverse throttle just to hold steady with the other boats in line. The bridge operator told us the next opening would be at Noon, strange since it was 10:30am. We them realized the time had changed but we had not. We lost an hour of our weekend. 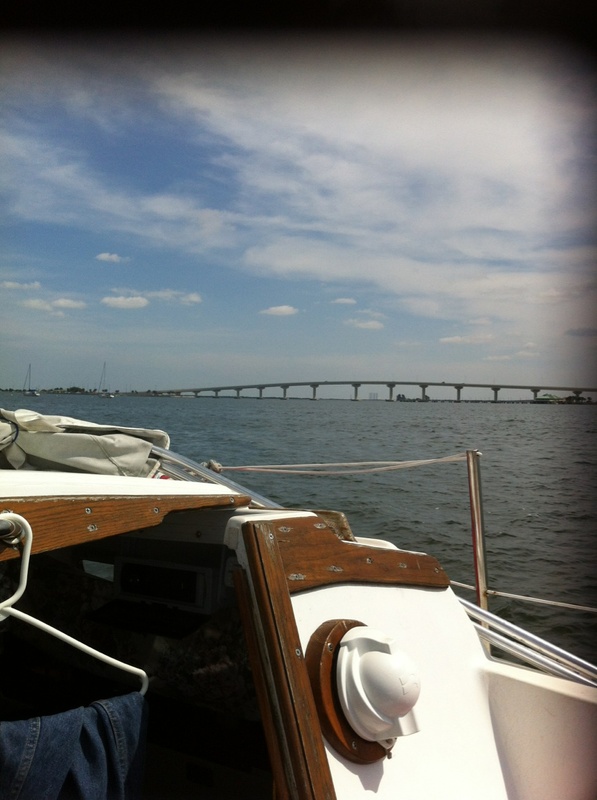 The bridge opened on schedule and we motored the rest of the way to the ICW and promptly turned into the wind, setting the boat in irons to enable use to raise the sails. Up they went and we turned north only to realize the wind was blowing at about 15 to 20 knots and we had too much sail up, healing the boat 30 degrees and sending everything flying about in the cabin. This was our first ever experience with heavy air. We had to turn back into the wind and shorten sail, as we tried to furl the jib back in a gust grabbed it, pulling the sheet out of the block with a loud bang, this actually worked to our advantage because as the jib flapped in the wind Lori was able to furl it in. We then dropped the main and all was calm again. I had ordered some Cunninghams (stainless steal hooks) to reef the sails online about 2 weeks ago, as the vendor was in Canada they had not shown up yet.So digging in the locker I found some fairly strong rope and proceeded to reef the main sail. The boat has what looks like a remnant of a reefing system at the clew of the mainsail so I had to improvise using a bowline knot and tying the clew off to the outhaul cleat. The front reef I did with a bowline and the line fastened to the cleat for the topping lift. I did find a line that was of the correct size and length to reef the center grommets of the sail. We recovered the port jib sheet and Lori restrung it through the block, then we raised our reefed main sail and proceeded north with the jib furled. We were making in excess of 5 knots and the water was rough. A fairly rough ride with an average of 10 degrees of heel. I could at times feel a slight thrum in the tiller as the boat would near hull speed. We made it just north of the midway point and the wind had fallen off enough we added about 30% jib. This actually made a great deal of difference. Less weather helm and more speed were the result. The tiller thrummed rather nicely. 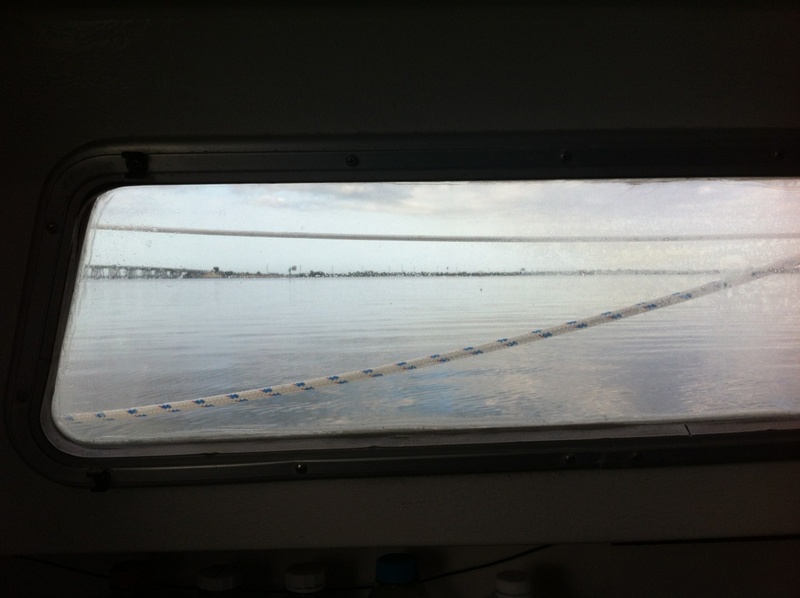 At 4:15 we were tied in our slip in Titusville and I was taking a nap below. We made great time but it was a lot of work. Since our marina requires payment for electrical power we have decided to go solar with a 30watt panel. At the moment we are short a battery (one was bad) and only have 175 or so Amp Hours of capacity. The partial overcast, VHF radio, depthfinder, vacuum inflation of the dink, vacuuming up coffee grounds from the shaking up the boat took, anchor light and navigation lights after dark all contributed to pull the cell down below 11.12 vdc in about 36 hours. A level that will not charge an Iphone. I now know I need to get the second cell back installed and wire the outboard to charge the batteries when it is running. If we plan to be out and about for a few weeks we will need to better manage our power usage and charging. All in all, a full weekend on the water. We had a good time. Its Thursday and the weekend is round the bend. Looking to get two days of sailing in this weekend and also want to get the dinghy in the water and fiddle around. On an unrelated to sailing subject, I was able to get the hack running again. Turns out it had a fouled plug. Easy fix. Went to visit the clue for the first time in two weeks. When we purchased her she had water in the bilge. Not much but a little sloshing about. I finally go around to vacuuming the water out a few weeks ago. It has rained quite a bit in the last few weeks and happy for us the bilge is still dry. We still need to re-bed and tint the windows but at least she is not making all that much water. Wired and rewired some of the electronics yesterday. Now the both radios run through the internal breaker panel, less chance of leaving the VHF on by mistake. Also replaced some lower grade connectors with heat shrinks crimps. Love the way the heat shrinks work, and since we bought a proper ratcheting crimper they go together real well . Both the radios you say? Yes, we installed a Sony receiver/cd/mp3 player in a gimbled waterproof case next to the VHF. I tied the antenna inside the hull up above the quarter berth. It seems to receive very well but we will have to try it out at more remote locations. We did not go out this weekend. Wind was over 15mph with gusts over 20mph. We had a transient pull into the marina and they promptly ran and damaged another boat while pulling into their slip. Makes me glad we do not have a vacant slip next door.